Last week I went to say hello to a friend who works in the local day care center. The cheerful environment and atmosphere of the visit still affects me. 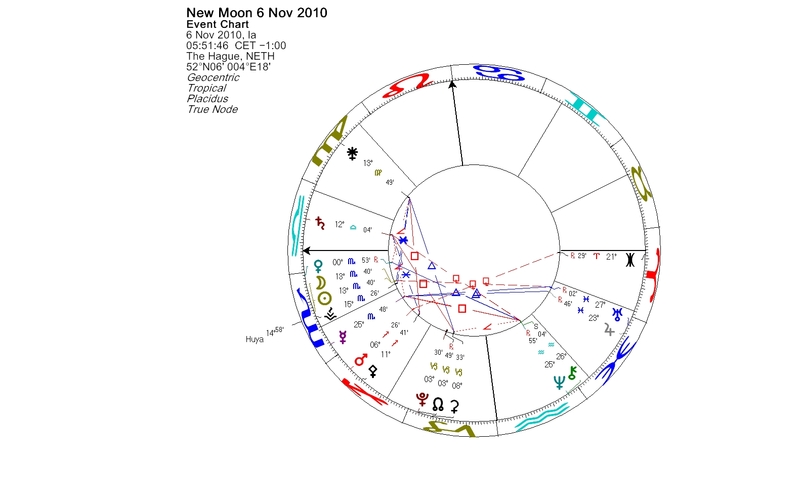 The Full Moon chart appears to me like a playground of little mermaids and comet chasers, in spite of some clearly stressful chart factors present. The Full Moon in the last degree of Taurus was loosely conjunct Sedna, one of the strangest little planets in our solar system. The Moon squared Chiron and strictly opposed two other Centaur planets, Chariklo and Echeclus, which both have an association with Chiron. Chiron works through raising awareness and at the Full Moon was asking for our attention by squaring the Sun-Moon opposition. The apex of any T-square is the driving force of the configuration. Chiron is in conjunction with Neptune, the god of water and the sea. After a long retrograde period, Chiron and Neptune have stationed direct earlier this month, which gives boost to their impact. The empty arm of a T-cross shows where the tension can be released. In this case it points to Leo, the sign which, among other things, can be associated with childlike playfulness. In astrology comets can be seen as messengers. Astronomically comets are distinguished from asteroids by the presence of a coma or a tail. However, the line between comets and asteroids is not always clear. Sometimes a comet can lose its tail, as it passes close to the Sun many times in its orbit. The ice evaporates away and the comet may come to resemble an asteroid. Chiron was the first object to be given a double designation of a comet and an asteroid (95P/Chiron). Echeclus is the only other Centaur object besides Chiron which has the dual comet and asteroid designation (174P/Echeclus). The Sun is in conjuction with Echeclus and Chariklo. Centaur planet Chariklo is named after Chiron’s wife, a water nymph in Greek mythology. Caring and commitment are her qualities. “Aphrodite emerges from sea foam, or spirit, into matter. We symbolically link the ocean to the unconscious or collective — the realm of Neptune. In fairy tales, the little mermaid becomes sea foam to be washed away by the ocean — ascension from matter into spirit.�? A reflection of the duality of the goddess shows in two images on a news page telling us how the statue of the Little Mermaid was placed back on her stone in Copenhagen after the long journey abroad. The images instantly reminded me about Sedna, the Inuit goddess of the sea. In the art Sedna is often depicted as a mermaid. In one of the many versions of the Sedna legend she is a skeleton woman. Sedna is a primordial, distant object beyond the edge of the Kuiper belt. Mike Brown discovered this reddish little planet seven years ago, in November 2003. Sedna travels 12,000 years around the Sun on its exceptionally long and elongated orbit, far from the planets. In an astrological chart Sedna is in Taurus, moving slowly and acting almost like a fixed star. Scientists are puzzled about Sedna’s crazy orbit. Why is it so strange? So far Sedna has kept her secrets. Until the astronomers find more objects in similar orbits, there is no way to know for sure. The Scorpio New Moon coincides with Kekri, the ancient harvest and new year’s festival of the Finns. Kekri has its origins in pagan times, as has Samhain, the Celtic cross-quarter celebration. In the old days the date of the Kekri feast was not fixed, but slightly varying yearly depending on the circumstances. Nowadays it is held on the first Saturday of November. The pagan holidays were based on the tropical year, i.e. the apparent annual motion of the Sun around the Earth. Solstices and equinoxes are called the quarter days, marking the change of the seasons and the Sun’s ingress into one of the cardinal signs: Aries, Cancer, Libra or Capricorn. A cross-quarter day falls halfway between a solstice and an equinox, when the Sun is at 15 degrees of a fixed sign, either in Taurus, Leo, Scorpio or Aquarius. Now the Sun is in the middle degrees of Scorpio. In the pre-Christian agricultural society Kekri was the most important festival of the year. It marked the end of the harvest and also the turn of the year. It was a communal celebration including abundant eating and drinking. People were looking for omens, and the spirits of the dead were said to wander in this world. The dead relatives were acknowledged as living members of the family, with whom the abundance of the harvest was shared. The spirits were invited to bathe in the sauna, too. Aptly the New Moon in the mid-degrees of Scorpio occurred in conjunction with asteroid Vesta. Vesta is associated with the element of fire, and bonfires played a large part in Kekri festivities. The Romans regarded Vesta as the goddess of the sacred flame and the guardian of the home. A hearth was the centre of the household. At the end of the harvest season the outdoors work was finished and people moved working inside the house. Astrologically Vesta is often seen as the ruler of the sign Virgo, but there is also a correspondence between Vesta and Scorpio. A common belief has been that there was a Karelian god named Kekri which protected cattle, but this is a misconception. Later studies show that Kekri was a ghost, a spook, or an elf. Kekri and other pagan harvest festivals in different cultures became linked with the Christian holidays dedicated to saints and the dead and celebrated in the beginning of November. In contemporary Finland we light candles and visit the graves of deceased relatives. Some of the traditions associated with Kekri have devolved on the modern Christmas and New Year’s celebrations. Also Halloween and many of its symbols, like lanterns and skeletons, originate from the ancient celebrations. Huya, a trans-Neptunian object and a dwarf planet candidate, is in conjunction with the Sun, the Moon and Vesta at 15 degrees of Scorpio. Huya will come to perihelion (the point in an orbit that is closest to the Sun) in 2015 and is currently inside the orbit of Neptune. Huya was discovered about ten years ago by Venezuelan astronomers and named after the god of rain and hunt of the Wayuu who live on the arid La Guajira Peninsula between Colombia and Venezuela. The Wayuu believe that the life cycle doesn’t end with death, but that a relationship with one’s bones continues. A few years after the first burial, a woman gathers the bones of the deceased and cleans them. Then the remains are buried again. The second burial has been an important tradition. Long-dead Wayuu are believed to return on the Earth in the form of rain, which assures the rejuvenation of vegetation and life. Herranen & Kaartinen, Kauan eläköön suomalainen kekri! You are currently browsing the Lunations by Kirsti Melto weblog archives for November, 2010.